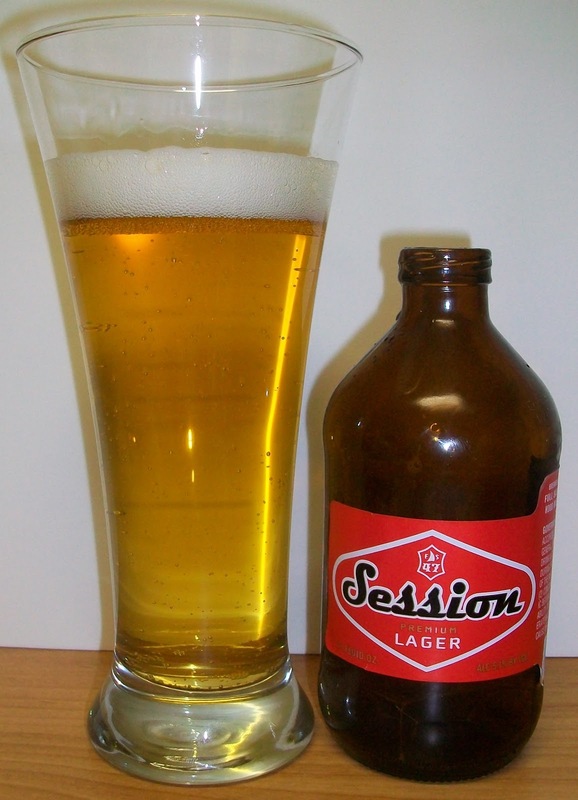 Original Session, with the bright red label, is a classic all-malt pre-Prohibition style lager that reminds us of what American lagers used to taste like. It's flavorful, refreshing, and has a touch of that import-style taste. (Which, once upon a time, you didn't have to buy an "import" to get.) Oh, and it comes in a stubby, 11-oz bottle like your grandpa used to buy. So after your next session (surf, jam, gab, whatever), crack open a Session and drink to the good old new days. Named World's Best Premium Lager at the World Beer Awards and winner of a slew of other shiny trophies, Session has truly earned itself a place at the bar. Not to mention the barbeque. My friend Joe has been waiting or Full Sail to arrive in our area since this summer. Just a few weeks ago we realized that State Line Liquors added Full Sail to their lineup. Joe proceeded to purchase several Full Sail beers and in turn he gave me a sampler of the Session Lager, Session Dark, Amber and IPA. So this will be the first of 4 Full Sail reviews. The beer pours a crystal clear golden straw color with a bright white head. The nose is great for a Pale Lager, maybe even the best; pleasant pilsner type malt aromas with just a slight floral hop aroma. Wow, this may be the best Pale Lager I ever had. This is clean crisp and refreshing. This may be next summers staple beer. The problem is that this is a Pale Lager so there is not much going on or much to describe. But for what it is this is fantastic. It starts out with light sweet pilsner type malts up front then the most refreshing effervescence over the tongue in mid-sip. The back-end is very easy drinking with an effortless swallow. There is also a nice carbonation release during the swallow that adds to the refreshing aspect of this beer. The finish is crisp and clean with the perfect amount of light malt flavor and just enough hops to dry with out bittering. I’m very impressed with this Pale Lager. It is clean, crisp and refreshing. I feel like I just went through the time tunnel and ended up in the hay day of American Brewing when beer tasted like beer. There are no off flavors that the American Adjuncts have. There are no grassy notes of corn or rice in this beer. I just wish all the American beers could taste like this again. We have warmed up to 56 degrees now. As this beer warms a little there is an almost sweet note to the finish. Well, this is another short review since the glass is empty already. I’m giving this one an A (Rating in Class). So far I think this is the best example of an American Pale Lager and now my gold standard for this style. This beer is clean, crisp and refreshing with a nice light malt flavor and a dry finish. This is the perfect American Beer. This is what all those American Macro’s should taste like. I highly recommend this beer to any and all common American beer drinkers; meaning anyone that drinks the big American macro beers from Anheuser Busch and Miller-Coors. This beer is what all of those others should to taste like and probably did back in the day. I don't usually comment about the price but that may be an issue with this beer. ~$16.00 a 12 pack is a great price for a good Craft Beer but this is just a Pale Lager. At any rate this is a great Pale Lager. Thanks Joe for a great experience.